Saturday also features the Wilwood Corvette Challenge, Bimmer Challenge, HFF Challenge, and 86 Cup. Sunday also features the S2K Challenge, Nissan Challenge, and Subie Challenge. Both days also feature Maxxis Supermiata Cup, Spec Corvette, and V8 Road Racing West races. 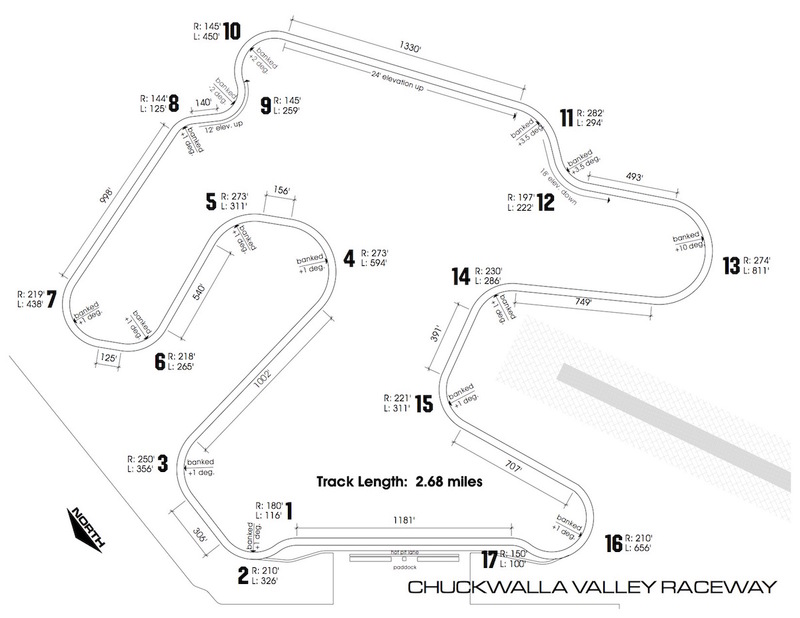 LOCATION: Chuckwalla Valley Raceway is located at 25300 Rice Rd Desert Center, CA 92239 just off Interstate 10 near Desert Center. There is a $15 GATE FEE for your first day entrance + $10 for each additional day ($15/1 day, $25/2 days, $35/3 days). SCHEDULE: A full schedule will be emailed out a day or two before the event and provided at registration when you check-in. You should plan to show up at the track no later than 7:00am, though you may want to give yourself more time since sometimes there can be a long line at the gate. Check-in generally begins at 7:00am and ends at 7:45am. Our drivers' meeting begins as early as 7:40am for Advanced Group drivers. This meeting is MANDATORY for all drivers unless you have received prior clearance to miss it. Please come to registration first BEFORE unloading/prepping your car to be sure you do not potentially miss your first run session of the day! FOOD & DRINK: Speed Ventures provides a water dispenser with which you can refill your water bottle, canteen, cup, or camel. Please bring something to the track to drink with. The snack bar will be open for breakfast and lunch. LODGING: We have a host hotel in Indio for this event: the Best Western Date Tree, 760-347-3421 (www.datetree.com), which is offering a special Speed Ventures rate of $92.99+tax (limited availability, call now!). Please say you are with Speed Ventures when booking your room! Either a TOW HOOK or some TOW POINT is highly recommended on the FRONT (and optional on REAR) of your car before going out on track. The important thing is that you have a place picked out for the FRONT that we can hook on to in order to tow you off track. Please determine appropriate tow points - it is your responsibility and we will not be responsible for any damage done to your car if you do not have a tow point installed or figured out. DRY CAMPING is available. Hook-ups are not provided. Dump stations and water are available, as are bathrooms and showers. In addition to the $15/person entrance fee (+$10 for each additional day), there is a $20/vehicle security & overnight fee for campers. Gates will be open 24/7, if you are dry camping or renting a cabin please speak with the gate attendant when arriving.